Denby Dale Ladies’ Choir is a three-part ensemble of around 35 voices. Our varied repertoire is always growing and includes classical, traditional, jazz, showtime and modern pieces. We love singing and our track record of festival success proves it’s possible to blend achievement with real fun! Please also visit our Facebook page to see us in action. Come and hear the choir! Check out our upcoming performances and bookings on our Diary page: we’d love to see you at our next performance! And if you think you’d like to be part of a vibrant and friendly choir, come along to a rehearsal and find out more. We’re always interested in welcoming tuneful new voices who are interested in improving their vocal and choral skills. Want your wedding, celebration or fundraising event to sparkle? Simply hire our choir! 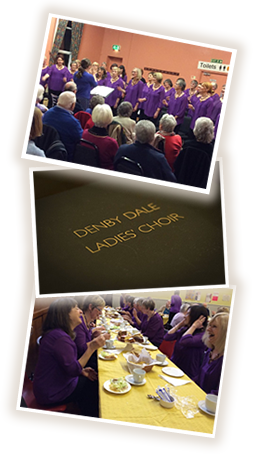 You can book Denby Dale Ladies’ Choir to perform at any special event. Find out more or call us on 01484 862764 and 07432 148 719 to talk it through. Copyright © 2012 denbydaleladieschoir.co.uk. All rights reserved.